This is my family's new avatar from DoppelMe. Aren't we cute? And LibraryThing is an awesome site for book junkies like me. I always try to learn something. Everyday there are opportunities, we just have to pay attention. I’m not always so good at that part, but I’m trying! This week I’ve been busy at the library, working on improving the blog, and of course making time to crochet. Although I will admit that I’ve been devoting more attention to the blog and less to my crochet than I’d like. After all, if I don’t keep making steady progress on my projects what am I going to write about? Blogging about blogging isn’t what I set out to do. However, this week I’ve been researching and reading about how to build a better blog to make it more interesting for all of us. Here are two cool things that are worth sharing with other beginners like me! An application or a component of an interface, that enables a user to perform a function or access a service. That means they are the little bits and pieces that help give your blog some flash and flair! Here’s a short article with helpful links that clearly explains what they are and where to find them. I didn’t realize how prevalent they are or how easy they are to find. I’ve been manually cutting and pasting all of my books’ code from my Amazon account to my blog to add some visual pep. It’s not hard, but it is time consuming. In my research I came across many references to LibraryThing and saw book lists and covers on other peoples blog in what I know now are widgets that are “powered by LibraryThing”. A trip to their site and I found that they’ve set everything up for me to keep track of my library and reviews. Plus they make it super easy to create a whole variety of good looking widgets. Today I discovered that when I updated my library with a book rating and review, it automatically updated my widget. How cool is that! If you’re a book lover or just looking for an easy place to keep track of your reading, I really recommend that you check it out. The graphical representation of the user or the user's alter ego or character. It may take either a 3D form, as in games or virtual worlds, or a two-dimensional form as an icon in internet forums and other online communities. 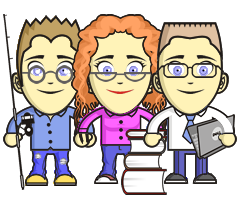 I didn’t find much written information about avatars, but I did find this great website called DoppelMe where I created avatars for me and my family! It was terrific fun and I think we look great. Once they were done it was easy to copy and paste the html code (or just a copy of the saved avatar picture) into the blog as well as in my Ravelry and Hotmail accounts. Oh and did I mention they’re free? I had been wondering where folks were getting these neat cartoon images and well, now we know at least one place to find them. So there you have it! I’m glad to be able to share a little bit of what I learned this week. And I’m excited to add a bit of spice to my blog. After all, everything’s better when it’s spicy!